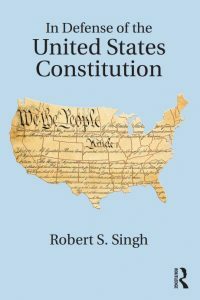 Robert Singh, Professor of Politics at Birkbeck, defends the US constitution at a time when many say it offers more problems than solutions. His ideas are explored further in his new book In Defense of the United States Constitution, available from Routledge. According to that eminent politics scholar, Morrissey (Spent the Day in Bed), we should stop watching the news, “because the news contrives to frighten you.” As far as politics in the United States goes, he surely has a point. Breathlessly excitable news coverage and learned academic pronouncements of the “death” of democracy together induce a sense of bewilderment, producing more heat than light about what ails America. And invariably this is traced to the ultimate political “original sin,” the US Constitution, faulty more by defective design than cack-handed execution. But is the Constitution, as many scholar-activists assert, the source of, rather than the remedy to, US problems, from gun violence to agitated air passengers invoking the “right” to travel with “emotional support animals”? Does Trump’s presidency again reveal its inherent fragility, proclivity to periodic crisis and the hollowness of eighteenth-century parchment promises? These altogether more problematic claims are triply doubtful. First, we should separate politics from constitutionalism and beware the all-too-promiscuous use of the term “crisis.” A genuine constitutional crisis requires a disagreement about constitutional obligations that is impossible to resolve via constitutional means. The Civil War was the one undisputable such crisis in US history: an existential conflict posing a choice between alternatives that allowed no compromise. Others, from Watergate and Iran-Contra to Monicagate and today’s lurid charges, are more resolvable political crises with constitutional dimensions. Second, while Trump has undermined multiple norms and conventions previously taken for granted, the extent to which these indict the constitutional design is questionable. Even if a Democratic House of Representatives begins impeachment proceedings against him in January 2019, the question of whether Trump’s alleged violations of statute law rise to the standard of “high crimes and misdemeanours” is ultimately a political, not a legal, one. Trump’s tempestuous encounter with the Constitution has proven only his most recent and important instance of serial infidelity. But it has damaged, not endangered, the republic. Third, there exists a powerful case – which impeachment would vindicate, not repudiate – that “the system worked.” The political circus since January 2017 may have been compelling viewing in its car crash qualities, but it also demonstrates certain enduring structural strengths of the US design. Trump has not had his way on public policy, despite his own party controlling both houses on Capitol Hill. The courts have been able and willing to strike down laws and executive actions they deemed unconstitutional. Civil society remains a cacophonous and vibrant force. None of this is to suggest that all is right with things constitutional. The Constitution is far from flawless and some modernizing fine-tuning would not go amiss, regarding the composition of the US Senate, the method of allocating votes in the Electoral College, and the amendment process. But it merits neither rubbishing nor romanticizing. A rare focus for unity in an otherwise fractious polity, the Constitution is not the source of today’s problems (the Second Amendment, for example, does not prohibit strong firearms regulation). Nor are constitutional “fixes” the solution. Radical change, where feasible, is mostly undesirable, and where desirable, mostly unfeasible. It is politics – above all, the deeply entrenched partisan polarization that preceded and will outlast the 45th president – that is responsible for contemporary maladies. On most comparative metrics, the Constitution performs well and emerges much better than others. 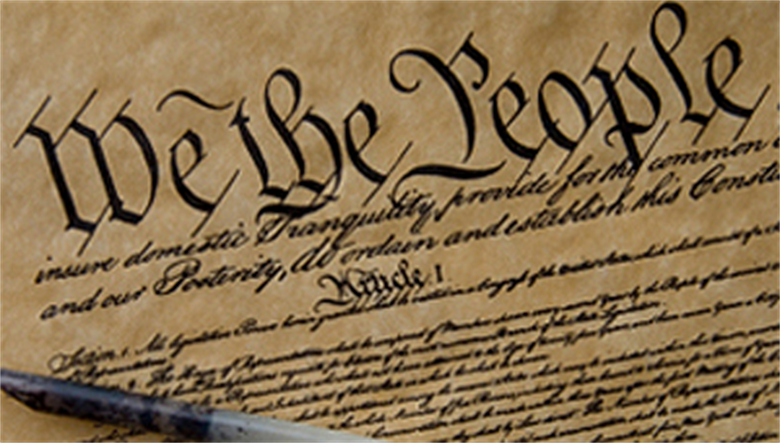 An effective constitution should provide a stable framework for government by channelling societal conflict into everyday politics, allow the expression in law and policy of majority preferences while safeguarding protections for individual rights and liberties, ensure the peaceful transfer of power, and permit the means of its own revision through amendments and interpretation. The Constitution meets these core requirements, and its own Preamble’s six objectives, now more fully than at any time in US history. It is not merely adaptive but “antifragile”: gaining strength from the tests to which it is periodically subject. All of which suggests: Keep calm and carry on constitutionalizing. The republic has not been read the last rites. The Constitution has not been trampled under goose-steps. American democracy is not in its death throes. The news might frighten you, but the US Constitution should be a cause for enduring comfort rather than disquiet.